STS-59 launched with my crew 22 years ago today, April 9, 1994. What an introduction to spaceflight, and to our planet’s beauty. Our crew on the Space Radar Lab 1 mission took this image looking north at the southern tip of Greenland. We were only 113 nautical miles up, and about 180 miles south of Greenland when we used a 250mm lens on a Hasselblad camera to get this tight image. Steep-walled fjords lace into Greenland’s mountainous coastline. 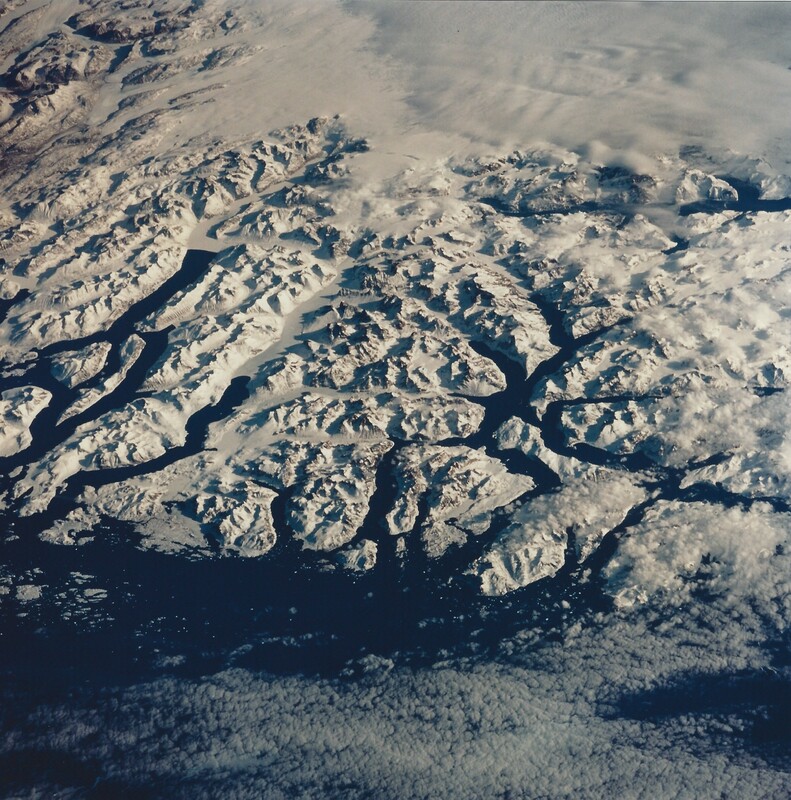 The razor-sharp peak pointing south at the center of a spider-like pattern of fjords, just right of center, is Nuk. Narsaq Kujalleq, a small town of 97, lies on the fjord to the west of that small island at bottom center. At the left center edge of the photo is the town of Nanortaliq, with 1337 people. It’s a struggle to find named landmarks in Greenland–so few people, so many mountains and fjords. I’ve seen Greenland from a B-52 cockpit and on an occasional transatlantic air trip, but never touched land there. Someday soon, I hope. 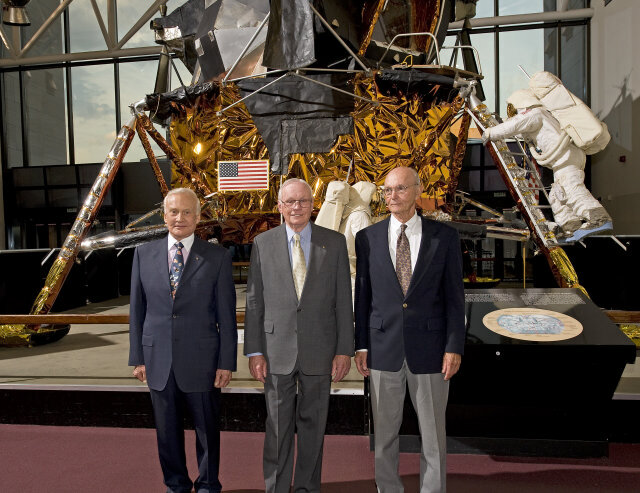 July 2014 marked the 45th anniversary of the Apollo 11 mission, the first time astronauts visited and walked on another celestial body. I recorded my memories of that event, and the inspiration it brought to me, at the #Apollo45 YouTube channel. Here is my video link. What do you remember seeing–and feeling–on July 20, 1969? In a tradition dating back to Alan Shepard’s first U.S. spaceflight in 1961, astronauts are served a favorite meal before suiting up and heading to the launch pad–and space. 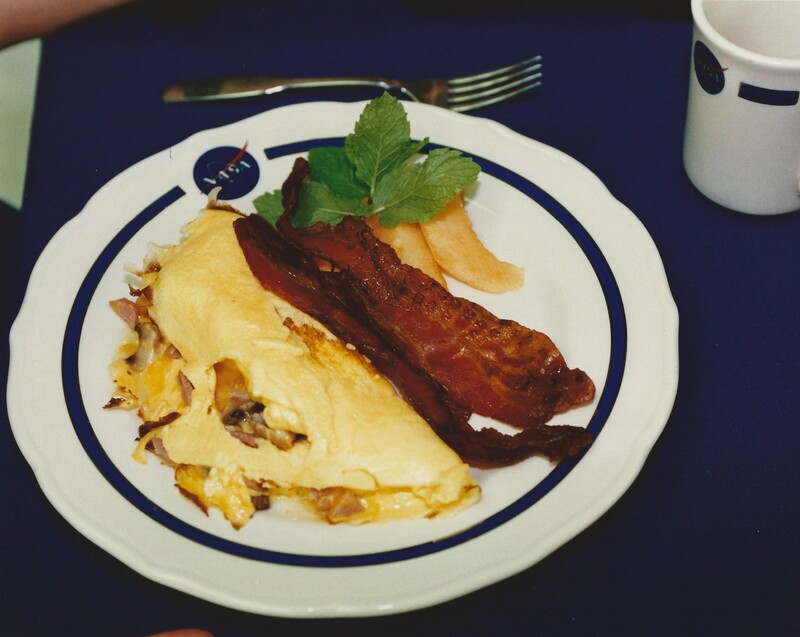 On STS-68, scheduled for an Aug. 18, 1994 launch, I asked the dietitians at the NASA Astronaut Crew Quarters at Kennedy Space Center (my favorite was Dotti Kunde) to prepare a mushroom and cheese omelet with bacon, toast, fresh fruit, coffee, and orange juice. My crew gathered in the dining room of crew quarters for a ceremonial photo and a wave at the TV cameras, and a formal acceptance of our “mission cake,” a giant sheet cake with our SRL-2/STS-68 patch decorating the top. After the photos, the cake immediately went into the freezer and was delivered to Houston. We’d eat the cake when–and if–we actually returned from a successful mission. Of course, this was just the first launch morning breakfast I’d enjoy on STS-68. I came back six weeks later for another one, following our pad abort on August 18 and Endeavour’s return to the pad for our next attempt. But that’s another story…. Thank you, Dot and friends, for a delicious breakfast. It was plenty tasty enough to make one intent on returning to Earth. 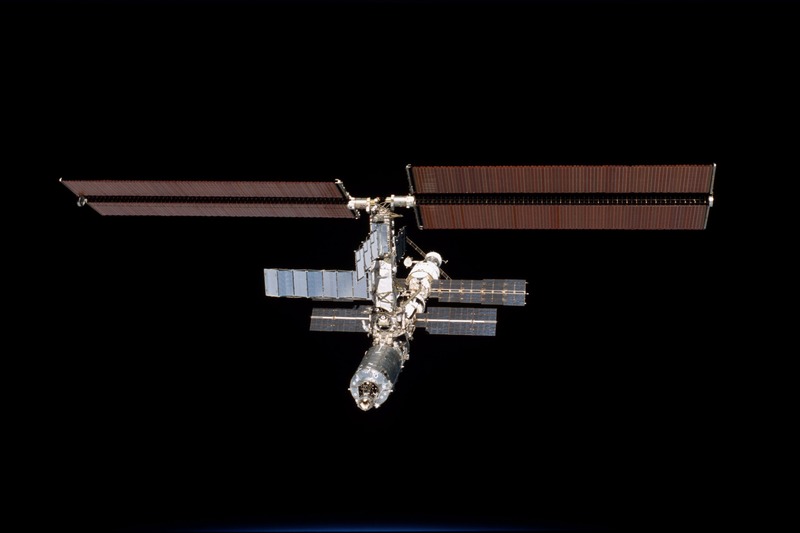 Did UFOs Visit STS-80 Columbia? To understand the ending of the story, I have to begin at the beginning. In June, our family made a marathon round-trip to Camp LeJeune, NC to bid farewell to our son Josh, a Lance Corporal with the 2nd Battalion, 6th Marines, who was deploying to Afghanistan. We arrived a scant 90 minutes before departure, barely enough time to hug him one last time, tell him how proud we were of him, to reassure him (and ourselves) that he would be back before too long. I think it was the first time I truly realized how scared he was, how terrified I was. As hard as it was to say goodbye to him, it was almost harder to see the Marines saying goodbye to their children, their pregnant wives, the babies who would be celebrating their first Christmas without their dad. One Marine dad sat on the ground and played one last time with his young son. The families stood in the parking lot as the buses pulled out, waving until they were out of sight. And then a new family formed…a family of those left behind. We hugged, we cried, we gave words of encouragement and strength, we exchanged names, email addresses, and phone numbers. After a bit we were able to tear ourselves away and head home. As the months crept by we heard infrequently from our Marines, but as soon as one of us did, the word was passed. It didn’t matter that they were in different companies, different parts of Marjah, different jobs. One of our own was heard from, and we celebrated. Facebook became a lifeline for us. Like all families, we mourned each combat loss, celebrated each new member of the 2/6 family added by birth, consoled those whose Marine was injured, shared news about travels and illness. Life went on here in the States, and the family formed in that parking lot was there for support. In November we were given tentative arrival dates. 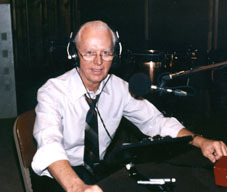 Each company was assigned a three to five day window; Fox Company was due January 4 – 7. Excitement began to build, a flurry of information about travel arrangements and hotels was exchanged, welcome home banners ordered, and the countdown began. The days dragged on, the holidays came and went without too much celebration. On January 2, we got our 48 hour confirmed notice; Fox Company was due to arrive onboard Camp LeJeune Tuesday, 4 January at 1930 hours. It was time to head back to North Carolina. It was time to welcome our Marine home. I think that Monday was 100 hours long! 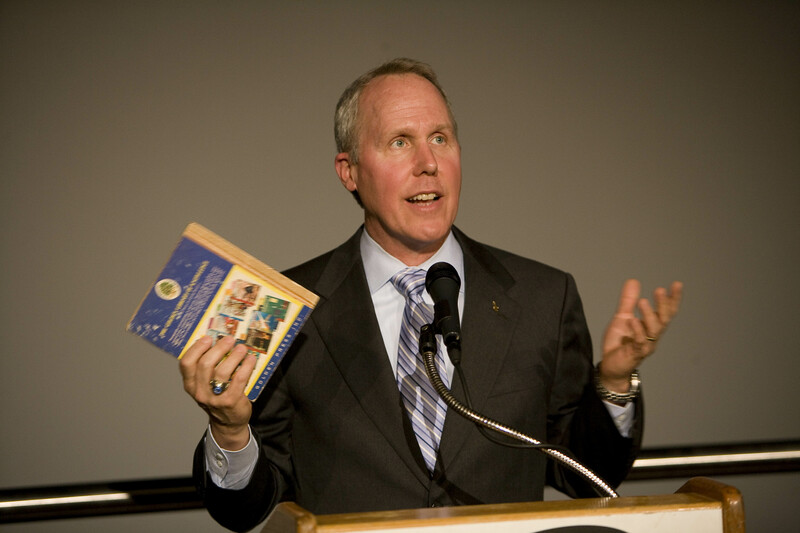 The students in my classes kept asking me what was wrong…I couldn’t sit still, I couldn’t concentrate…I now have a better understanding of ADHD! We left home at five in the morning on the fourth, seven hours later we were at the hotel in Jacksonville. We headed over to the base mid-afternoon; I had seven cases of Girl Scout Cookies and a huge carton of donated candy to deliver for the reception. We grabbed something to eat at the Commissary, found the rest of our family and friends who had made the trip, and headed over to the Field House. It was time to meet all those wonderful people I had met via the internet, and to say hello again to those I had met in June. Welcome Home signs hung from the bleachers, and the excitement and anticipation was almost palpable. Little ones played on the gym floor, wives clustered together, parents found each other and chatted, other Marines came in, many of them wounded, and waited with us for word that Fox Company was on the ground at Cherry Point, and enroute back to LeJeune. Around 6, cell phones began to ring, word began to spread as more and more of the Marines were calling their wives, their dads, moms, girlfriends…they were on the ground and headed back. Except they were still a good 90 minutes away, and they would first have to go to the Armory to turn in their serialized gear and weapons. The Marines would then march from the Armory to the Field House. The excitement continued to build and the wait became more and more unbearable. Finally, after hours of waiting, we heard they were at the Armory and then the announcement we were waiting for was made. If quite could be loud, it was. A silence fell over the Field House as the moments of waiting drew to a close. But it was a loud silence…maybe it was all the excited breathing, maybe it was the pounding of all our hearts, maybe it was the sound of joy. The doors swung open and in single file Fox Company began to march in. The roar of the crowd, the applause, all suddenly faded as I glimpsed Joshua coming through the door. I remember saying to someone the next day that it was like giving birth as he emerged into the Field House. I remember bursting into tears. I remember jumping up and down and whispering his name. As the Marines continued to come through the door, I again became aware of the noise, but I could not take my eyes from Josh. As the last Marine entered and stood in formation, the Company Commander (I think) made some brief remarks (I think it had something to do with the mission) and then, I swear, he dismissed the company. I bolted for Josh only to be stopped, because they had not been dismissed. Instead, all the members of Fox gathered around their leader, and they toasted the Marines who were not going to be coming home. Each of them popped open a beer they had been handed just before coming in to the Field House, and drank in memory of their fallen brothers. If there had been a dry eye in that building up until that point, there wasn’t any longer. The Marines were then dismissed, and I took off again. I got to Josh first, followed by other members of the family, and then his friends. I could not stop touching him. After Josh checked in to his new quarters, and I realized that none of the “civvies” we brought him would fit (he said they had nothing else to do but work out), we went out to dinner…it was, by now, 11pm. At the restaurant, following a Marine tradition, the family presented the now Corporal Gaither with his new NCO Ceremonial Sword. Eventually we found our way back to the hotel and ended what had been a very long, very emotional day. Almost three weeks later, I find myself still moved to tears by different things. We had delayed fully enjoying the secular aspect of Christmas until Josh began leave. I ordered a Welcome Home Cake with the Marine Corps logo on it. When I went to pick it up, I placed the cake in the bottom of the cart and went about shopping. One man passed me by and said “Semper Fi”. I was too stunned to respond. Another man stopped and asked about the cake. I explained and he said “tell your son thank you. Not many are willing to make that sacrifice so I can live in this wonderful country, and enjoy what we have here. And thank you for giving your son to us.” Then, as I was leaving the store, the guy who checks your cart and receipt asked me if my son had just gotten out of the Marines. I again explained that he had just returned from Afghanistan. The man reached over, hugged me and said “tell him a Vietnam Veteran says I’m glad he made it back and thank you.” After thanking him, I left the store in tears. I hide my tears from Josh when he offers up a short recounting of what he’s been through, what he’s seen. He has talked about bullets hitting the ground near his feet, about a buddy hit in the neck, a child who was shot. He talks about how they killed an animal purchased from a local farmer so the Marines could have something fresh to eat, how they couldn’t drink the water, how the children begged for food. He mentions the school that the Marines built and opened and how the girls wouldn’t go in to it, he talks about the irrigation ditches they had to jump over, how their feet were always wet. And he pulls out of his belongings a pile of small stuffed animals that people sent, and that he kept them to remind him of what he’d done, where he’d been, and how great it was that strangers remembered them. 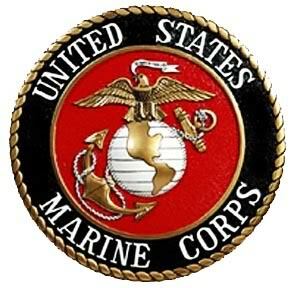 Our journey with the Marine Corps will probably end in June, unless Josh decides to re-enlist. For many reasons I think it would be a good thing for him to stay in, but I know that would, most likely, mean another combat deployment. I don’t know if I want to go through that again, I do know I will miss being part of a unique family. Semper Fi. I’m so glad that Josh and his colleagues are “watching our six”! Thank you for sharing this story, Elaine. In 2010, there were 17 new posts, growing the total archive of this blog to 99 posts. There were 22 pictures uploaded, taking up a total of 16mb. That’s about 2 pictures per month. The busiest day of the year was February 2nd with 598 views. The most popular post that day was The President’s Take on NASA’s Future: Mission to Nowhere. The top referring sites in 2010 were facebook.com, cosmiclog.msnbc.msn.com, twitter.com, home.comcast.net, and stumbleupon.com. Some visitors came searching, mostly for earth, panzer, p-47, space shuttle, and itokawa. Thank you to all my visitors in 2010, and best wishes for a Happy and Successful 2011! Check out this new film from United Space Alliance. A beautiful view of our foothold in space, discovering a better life on Earth. 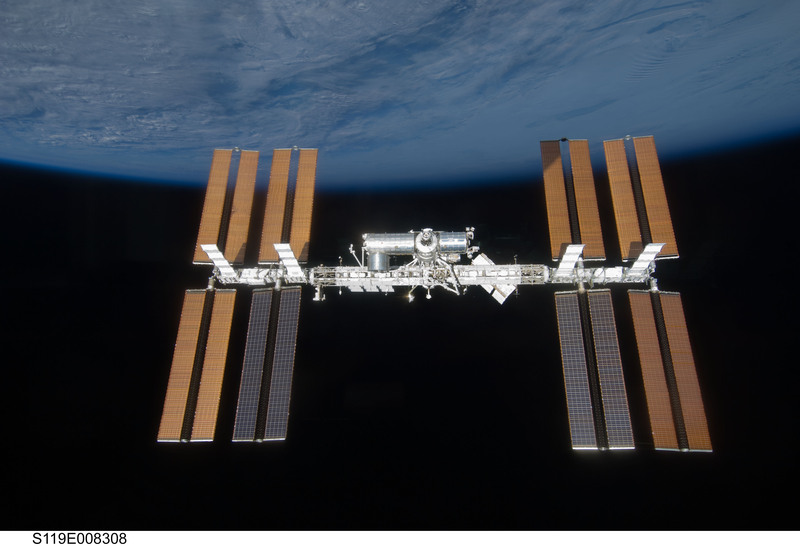 And the Space Station is just a stepping stone…to the Moon, the asteroids, and Mars! I appeared on Fox News Channel this morning, April 2, 2009, on America’s Newsroom, to discuss the new Orion crew exploration vehicle. Host Bill Hemmer conducted the inteview with me in Bldg. 9, the Space Vehicle Mockup Facility (SVMF) at Houston’s Johnson Space Center. Watch the 5-minute segment here. The Orion mockup in Bldg. 9 in Houston is used for crew seat arrangement tests, installation of proposed instrument panels and avionics, and fit checks of cargo container designs. Other mockups of the Orion crew module are involved in water handling and recovery tests (next week at the Cape), the Ares I-X flight test launch from Pad 39B in late summer, and in the upcoming pad abort tests at White Sands Missile Range, NM. 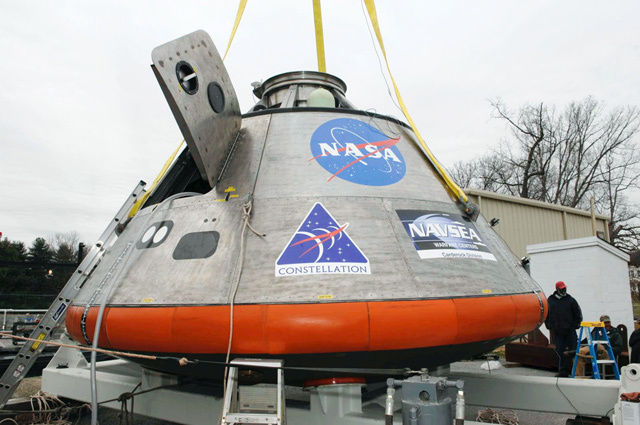 Orion is the shuttle’s replacement. It’s time to get on with building and flying it. We will miss the shuttle. But it can’t go to deep space. 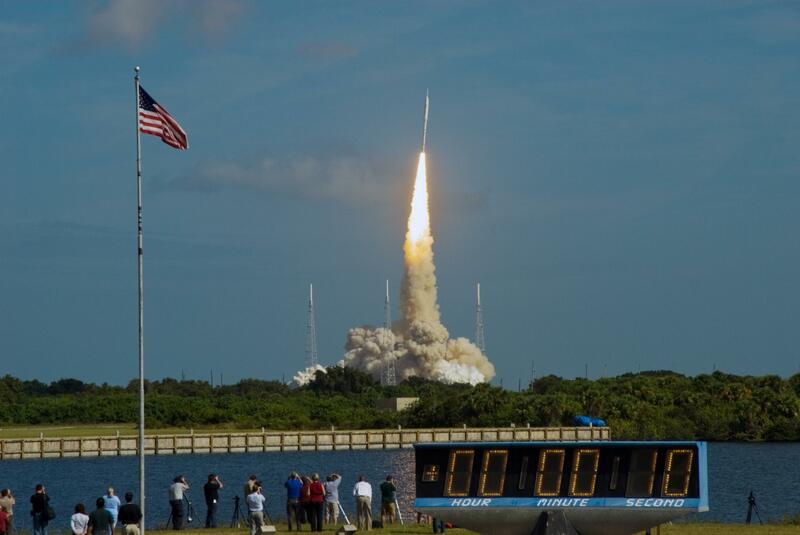 America needs Orion to continue to lead in space exploration.